The patented REAlease® MicroBead Technology is the next step in flexibility in cell isolation. It allows for the removal of magnetic beads and any labels from positively isolated cells, enabling you to be more flexible with downstream applications. Getting label-free cells does not have to be complicated. REAlease Technology relies on engineered antibody fragments that, when in a monomeric state, have low affinity for an epitope. When multimerized in a biotinylated REAlease Complex, this complex binds to cell epitopes with high avidity. Together with a REAlease MicroBead, the target cell is magnetically labeled. 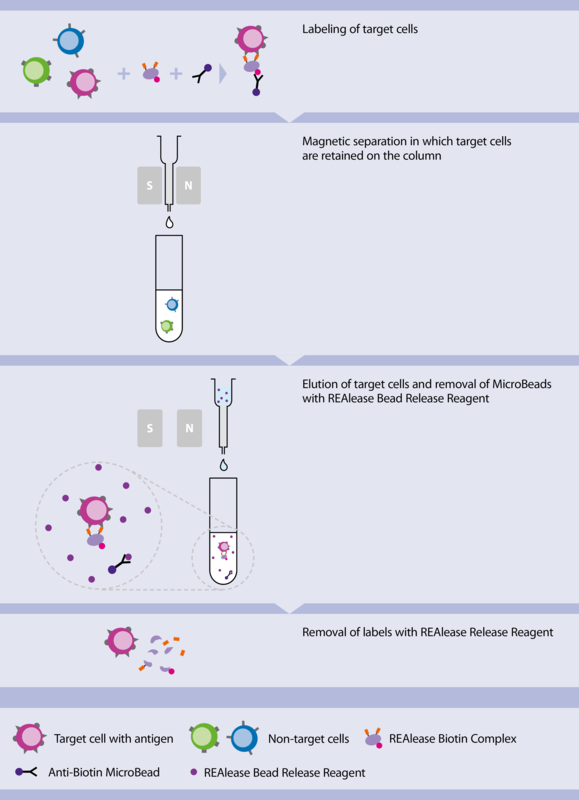 During magnetic isolation, labeled target cells are retained within the column and thereby separated from non-labeled cells. To get MicroBead-free target cells, the REAlease Release Reagent is applied to the column during the elution step. The eluted target cells are free from REAlease MicroBeads and can be subsequently used for a second round of magnetic isolation e.g. using regular MACS MicroBeads. 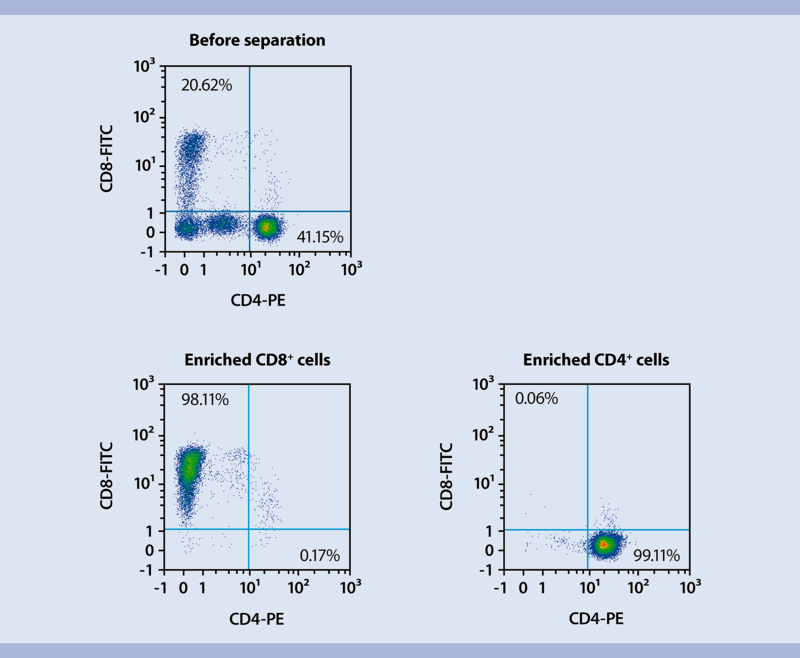 Label-free target cells can be obtained by addition of the REAlease Release Reagent. This leads to monomerization of the antibody fragments and dissociation of the complex from the cell surface. The result: cells that are free of any labels. As their epitopes are completely available for re-labeling, the cells are suited for any downstream application. Untouched isolation of cells from challenging samples, such as tissue or PBMC suspensions with abnormal cell frequency distribution, is hard to achieve. REAlease MicroBead Technology allows sequential isolation of cells to get to your cell subset of interest. REAlease Technology allows for the positive selection of a target cell type followed by the positive selection of another target cell type from the first negative cell fraction. The use of REAlease MicroBeads for both separation steps results in two label-free cell populations. In the experiment shown, CD8+ cells were isolated from PBMCs using REAlease CD8 MicroBeads.The negative fraction of this separation step was used as starting material for the isolation of CD4+ cells with REAlease CD4 MicroBeads. Both cell populations were isolated with yields higher than 80% and purities exceeding 98%. With REAlease MicroBeads, you can perform positive selection of a target cell type followed by depletion of unwanted cells from this cell population using regular MACS MicroBeads. 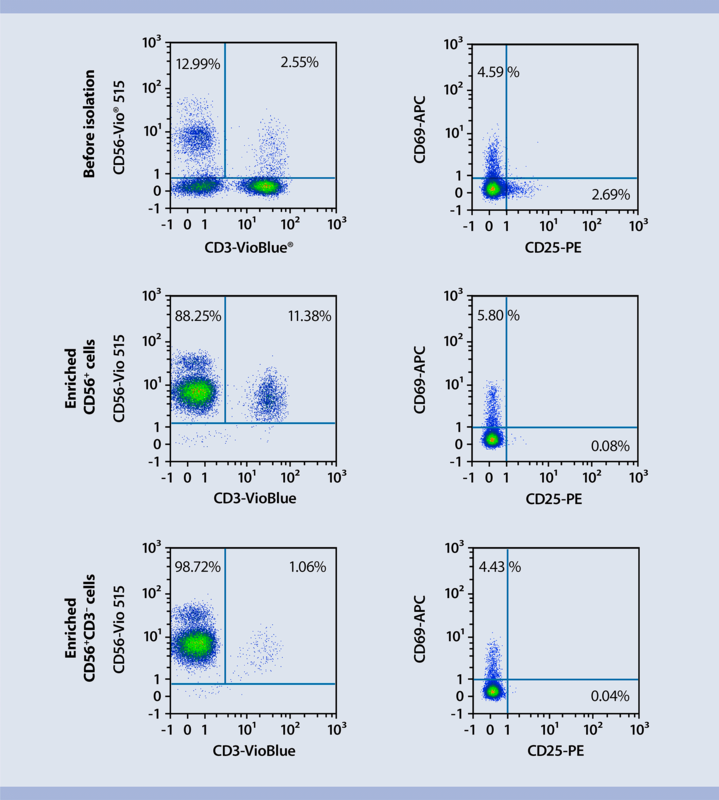 REAlease CD56 MicroBeads were used for the enrichment of CD56+ cells from PBMCs. After removal of the REAlease MicroBeads, the CD3+ cell fraction was depleted from the CD56+ cell population with MACS CD3 MicroBeads to yield CD56+CD3– NK cells with a high purity of 98%. No difference was observed in the levels of the activation markers CD69 and CD25 between the cells before and after isolation. 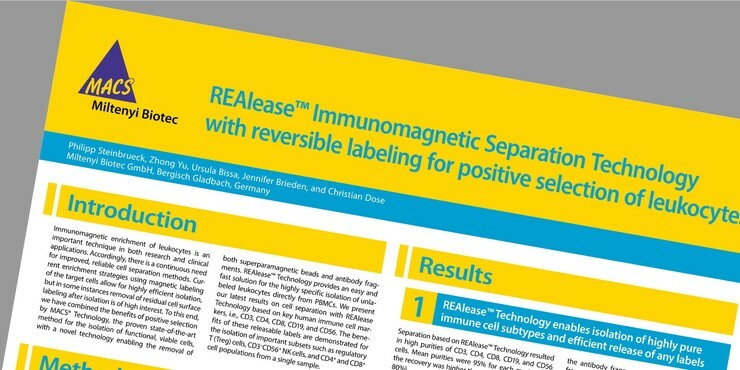 Download the brochure and find all the details on our REAlease Cell Separation Technology.